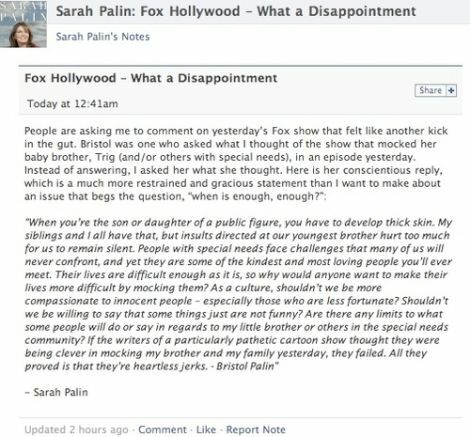 Sarah Palin took to Facebook today to criticize the "Hollywood" wing of employer Fox for the Family Guy episode where Chris goes on a date with a girl with Down Syndrome whose mother is "the former governor of Alaska." 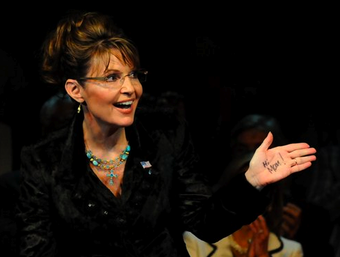 Commenter no_context points us to Palin's latest Facebook rant. She carefully directs criticism at "Fox Hollywood," a distinction that presumably leaves her direct employer, Fox News, in the clear. Though her choice of words is a bit, um, off, ("Kick in the gut" for the baby you brag about not aborting? 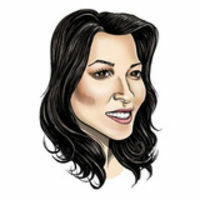 Sarah, Sarah, Sarah...) I mostly agree with Sarah and Bristol. Which, in turn, outrages me because I don't like agreeing with them. But comedic mimicry of retarded people is obnoxious. Even when it's self-aware, it's painful to watch able-minded adults ape at buffoonish caricatures of the mentally disabled—it feels too much like playground taunts from the fourth grade. I don't think Palin's kids are categorically off limits. The problem is that this joke (watch here) thuds. If you're going to make an off-color joke about people already ridiculed to a painful degree—well, first, don't do that. And second, have it make sense with with minimal context, because that's the way it's going to live on the internet, not with your mitigating happy ending, but as a rude little gag.